Apex 5/16'' hex insert drive Torx Plus bits from Apex Fastener Tools, formally Cooper Tools. The Torx Plus fastener and bit configuration gives a closer fit, 25% increased bit strength and up to 100% more drive cycles. The improved design of the Torx Plus bit excels even further with Apex know-how. Apex Torx Plus bits give you a precision fit, high quality steel alloys and our exclusive heat treat process. That means unsurpassed toughness, high torque transfer plus reduced slippage and cam-out. The 480-30IPX 5/16'' Apex Brand Torx Plus #30 Insert Bits is one of thousands of quality tooling products available from MRO Tools. Please browse Apex Torx Plus Hex Insert Bits for tools similar to the 480-30IPX 5/16'' Apex Brand Torx Plus #30 Insert Bits. 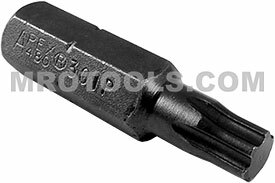 480-30IPX 5/16'' Apex Brand Torx Plus #30 Insert Bits description summary: 5/8'' Apex brand hex insert Torx Plus bits. driver size: 30IP major diameter: 0.216 overall length (in./mm): 1 1/4''/ 32mm Quantity discounts may be available for the 480-30IPX 5/16'' Apex Brand Torx Plus #30 Insert Bits. Please contact MRO Tools for details.